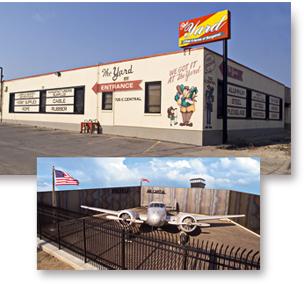 The Yard has been a Hidden Treasure as an institution in downtown Wichita and locally owned by the same family for over 70 years. Discount prices on foam rubber, vinyl for seats in cars, boats and furniture, plexiglass, Lexan, wire rope, aircraft cable, surplus from aircraft manufacturing, surplus for general manufacturing. Items for hobbyists, tinkerers, inventors and more can all be found in our aisles. Don't miss multiple buildings and over four acres of items to peruse. Inventory changes weekly. Visit The Yard on East Central for a unique shopping experience. For all your Aircraft Sheetmetal Tool needs please shop here. For all your Aluminum and Steel needs please shop here.